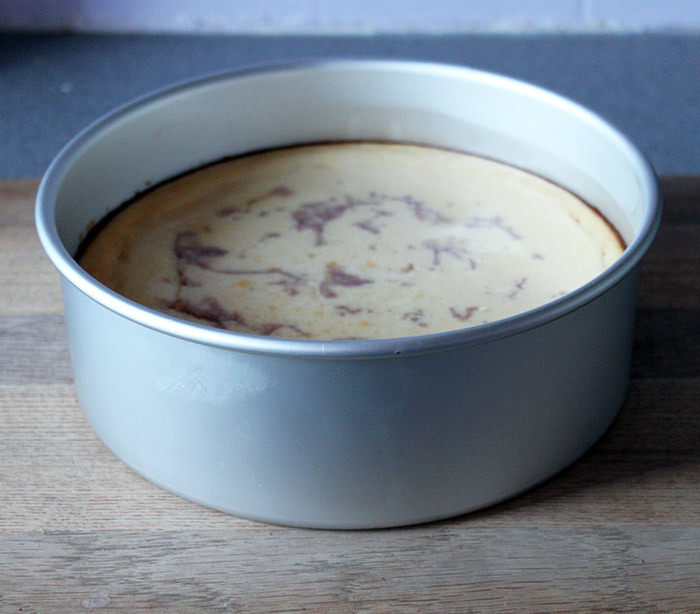 I have put off making cheesecake for years, reading so many recipes but worrying about cracks or soggy bases or that I wouldn’t be able to get it from the tin. But when it came down to it, it was actually super simple. I honestly don’t even notice doing it but when looking at cheesecake variations in the recipe book I automatically steered myself to the cherry and almond one. So this recipe could almost have been added to the infinite other baked goods I have made on the cherry and almond theme. However fate got in my way this time cherry and almond was not to be. 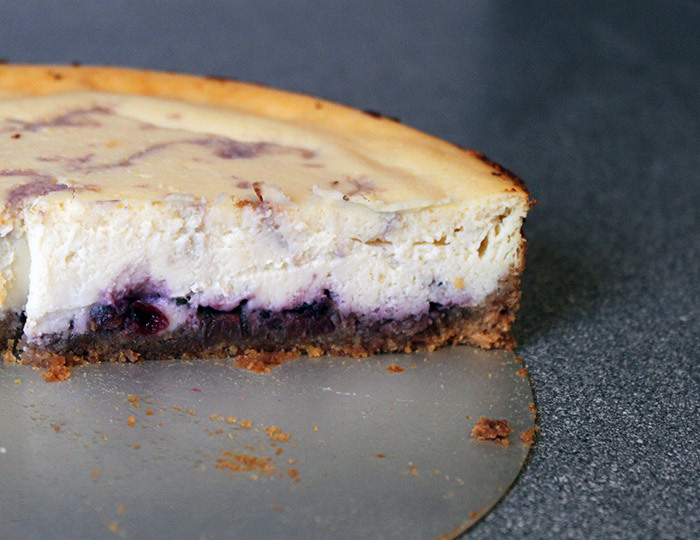 This is certainly not a recipe I would make every day, it has 3 tubs of cream cheese in it! To get the almond-y base I was supposed to use Amaretti biscuits, but I couldn’t find any. In the end I used ground almonds (from my macaron baking days) and some digestive biscuits. 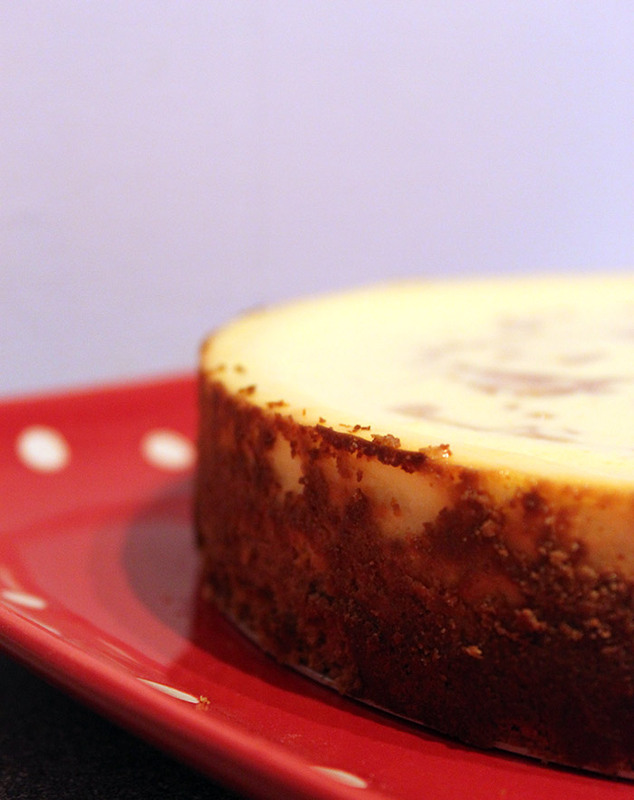 I used the recipe for New York style Cheesecake from Great Baking which you can also find online at Good Housekeeping. As mentioned before for the base I used 100grams of ground almonds and made up the rest of the biscuit base with digestive biscuits. It worked remarkably well. However I don’t think I packed the cups well enough when measuring because I definitely didn’t have enough to do the base and sides of the tin. Instead of adding milk to the filling I added two tablespoons of Amaretti liqueur. To add a bit of interest to the top of the cheesecake I watered a little blackcurrant jam down (maybe a teaspoon of water). After the mixture has been poured into the crust drop 1/2 teaspoons and use a knife to swirl it. The top of my cheesecake did crack a bit, I have since read that adding a pan of water to the bottom of the oven before and during cooking may help. Since I stopped doing Daring Bakers / Daring Cooks I haven’t really made anything out of my comfort zone – but this has proved that thinking something is difficult, doesn’t mean it is. When is the last time you baked or made something that scared you?